It's easy to forget, when you live near the sparkling expanse of Lake Champlain, that Vermont has lots of other lakes. To be exact, 46 named lakes, according to the Watershed Management Division of the state Department of Environmental Conservation. And that doesn't include some sizable ponds and reservoirs. These bodies of water boast their own unique beauty and, while not as convenient as Champlain is to Vermont's most populous county, many are more secluded, quiet and pristine. Some Seven Days staffers say they gravitate to the "cool, crisp, clean lakes" of the Northeast Kingdom. Others like the aquatic options around Middlebury, with the summer cottages and wealth of in-town activities during breaks from the drink. And then there are the hidden gems, tucked in the less-traveled crevices of central and northern Vermont. We've chosen to highlight the following seven lakes as day or weekend getaways for cooling off in the summer sun, paddling around to explore coves, pursuing trout or just enjoying the views. In order to narrow the focus, we've excluded ponds, swimming holes and rivers. All of the lakes named here are north of Vermont Route 4. Clearly, this is not a comprehensive guide to the state's waterways. Many lakes that didn't get onto our list of staff favorites have their own distinctive appeal — for instance, the sizable Lake Memphremagog, most of which is in Canada and in whose caves smugglers reportedly once buried treasure. Still, if this doesn't inspire you to take a few summer plunges, we don't know what will. Hands down the most-mentioned favorite lake among Seven Days travelers, Lake Willoughby draws devotees for its position among dramatic 1,500-foot rock cliffs cut into Mount Hor and Mount Pisgah. It offers "fjord-like views not seen in the rest of the state," one staffer says. Willoughby's water is cold and deep — 300 feet in some places. That makes it a hot spot, or really a cool one, for more advanced scuba divers. The National Park Service has declared Lake Willoughby a National Natural Landmark on the grounds that "It is the deepest lake in Vermont and one of the most significant and scenic examples of glacial erosion in the northeast." Visitors might see peregrine falcons, once nearly extinct and now fond of nesting in the mountain cliffs, and loons. Fishermen can find various trout, landlocked salmon, yellow perch and round whitefish. Less than seven miles from Willoughby, Crystal Lake has almost a mile of sandy beach and a marked swimming area in a state park site, with restrooms in a 1930s-era granite bathhouse. 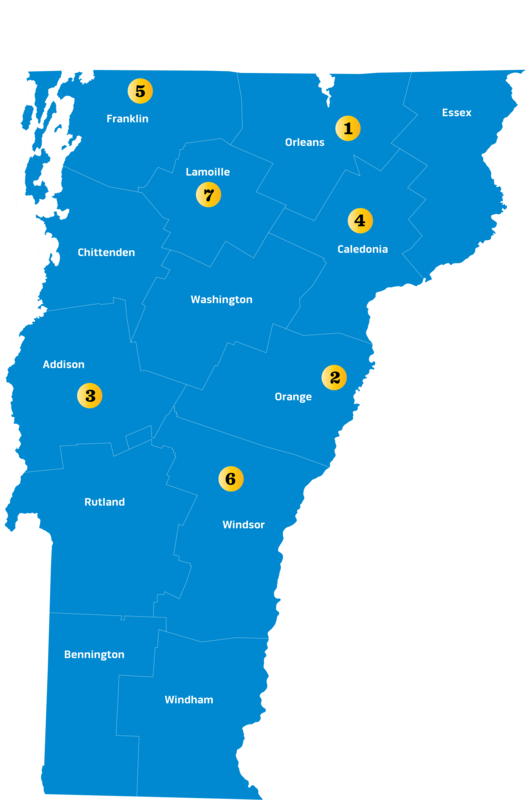 Where to Stay: Westmore: WilloughVale Inn and Cottages, Perkin's Hilltop Cottages, Green Acres Cabins, Vermont Mountain Lake Cottages; Barton: Pine Crest Motel and Cabins, Lakeview Cabins, May Brook Cottages; West Glover: Rodgers Country Inn & Cabins. Where to Eat: Westmore: Willoughvale Inn; Barton: Parson's Corner, Ming's House; Glover: Runaway Café, Cold Spring Kitchen, Busy Bee; West Glover: Parker Pie Co.
Where Else to Visit: Willoughby State Forest for good hiking, Sutton; Bread and Puppet Theater, whose museum of veteran puppets in an old barn opens for the season in June, Glover; Old Stone House Museum of 19th-century northern Vermont life, Orleans; Sugar Mill Farm, Barton; Windswept Farm for pick-your-own berries and apples, starting in June, Barton; Barton Golf Club. What's Interesting: Lake Willoughby has a nudist beach at its southern end. Lore tells of a lake monster, perhaps a giant eel, called Willy. In real life, the world's largest lake trout ever caught by tip-up line came out of Willoughby in 1996, caught by James Alexander of St. Johnsbury, according to the Burlington Free Press. 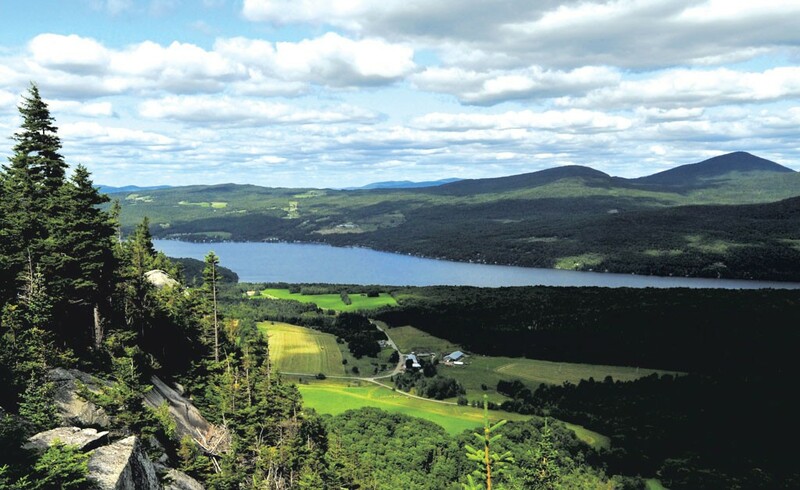 We've focused on Lake Morey because it takes prominence in Vermont lake lovers' minds, but it would pair nicely for a joint excursion with its nearby sister, Lake Fairlee. At 600 acres, Morey is small enough to discourage many motor boaters, though pontoon tours, water-skiing and tubing are popular. Its five-mile circumference encourages a run around the lake or a hike off the western side. Lake Morey Resort has a webcam so travelers can check on real-time conditions. Anglers can pursue trout, landlocked salmon and bass. In the winter, Lake Morey offers a 4.5-mile ice-skating trail, one of the longest in the United States. The historic lake community with its quiet cottages is one of the oldest in the state, dating to 1880, according to the Lake Morey Protective Association, a preservation group that looks out for property owners' interests. The town and association hold a Family Fun Day on the third Saturday in July at the town beach. Where to Stay: Fairlee: Lake Morey Resort, Fairlee Motel & Drive-In Theater, Silver Maple Lodge and Cottages, Ohana Family Camp; Corinth: A Special Place; Bradford: Bradford Motel. Where to Eat: Fairlee: the Fairlee Diner, Middlebrook Restaurant, Leda's Pizza and Restaurant; Bradford: Local Buzz, Hungry Bear Pub and Grill, Colatina Exit Ristorante, Stone Mill Tavern; East Thetford: Isabell's Café; Orford, N.H.: Peyton Place Restaurant. Where Else to Visit: Fairlee Hotel & Drive-In Theater for a movie; Lake Morey Resort for golf, horseshoes, tennis, cooking classes and a spa; Chapman's General Store, Fairlee; Farm-Way outdoor gear store, Bradford; Montshire Museum of Science, great for kids, with hands-on exhibits, Norwich; Pompanoosuc Mills factory headquarters, East Thetford; Cedar Circle Farm & Education Center, East Thetford; Dartmouth College campus, Hanover, N.H.
What's Interesting: The lake is named for Samuel Morey, a Fairlee resident who held the first U.S. patent for an internal-combustion engine. In the 1790s, he was one of the earliest developers of the steamboat — an idea that he claimed Robert Fulton stole from him and turned into a commercial success. "Morey is rumored to have sunk one of his early steamboat prototypes in the lake, though evidence of it has never been found," a Seven Days staffer notes. Besides having its own crystalline beauty and wide beach, Lake Dunmore is in a perfect spot for nearly every traveler. It's flanked by Branbury State Park and tucked into the side of Moosalamoo National Recreation Area, nearly 16,000 acres with 70-plus miles of hiking trails. One of the best of those, according to Seven Days staffers, is the trek to the Falls of Lana and its 100 feet of cascades. Another trail, Rattlesnake Point, offers peregrine falcon breeding grounds, as well as a panoramic view of Lake Dunmore. The lake is surrounded by quaint old summerhouses and welcomes kayaks, canoes and motor boats. A nearby state fish hatchery helps stock trout and landlocked salmon, and other catch includes bass, pike and perch. Branbury State Park, which once operated as a farm, has a 1,000-foot sandy beach ideal for barbecues and picnics. It's the starting point of the Vermont Sun Triathlon. About nine miles north of the lake is Middlebury, a mecca for art lovers with galleries, museums, shops, eateries and a bohemian vibe around Middlebury College. To the south by about eight miles, Brandon offers two wineries and its own array of shops, antique stores and restaurants. Where to Stay: Goshen: Blueberry Hill Inn; Ripton: the Chipman Inn; Salisbury: Waterhouses Campground & Marina, Branbury State Park campground, U.S. Forest Service Mount Moosalamoo Campground. 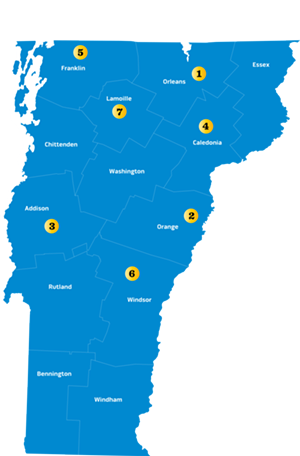 Numerous lodgings in and around Middlebury and Brandon, including Otter Valley Winery cottages and the Inn at Neshobe River. Where to Eat: Many options in Middlebury and Brandon, including Foley Brothers Brewing, Cattails Restaurant and Café Provence. Where Else to Visit: Museums, galleries, antiques and shops, Middlebury; Otter Valley Winery and Neshobe River Winery, Brandon; Brandon Museum; Brandon Artists Guild; Compass Music and Arts Center, Brandon; Book & Leaf bookstore, Brandon; New England Maple Museum, Pittsford; University of Vermont Morgan Horse Farm, Weybridge. What's Interesting: The shores of Lake Dunmore held the first glass factory in Vermont, which opened in 1813 to make windows. Vermont Glass Factory issued its own currency, with notes ranging in value from $1 to $5 — now hot collectors' items. After a fire, the factory shut in 1817, but Lake Dunmore Glass Company resurfaced in its place in 1832 and produced glass there for another decade. Caspian Lake fans love the pristine, clear water, and residents cherish the peace and quiet. In a tradition that goes back 60 years, the lake serves as an auditorium for classical music concerts broadcast on summer Sunday evenings from the Landon Lake House on the southern shore. Visitors and residents listen to the strings and woodwinds from their boats, docks and porches. The town has a public beach and boat launch. A daytime 40 mph speed limit helps keep the power boaters in check, while scuba divers enjoy the 142-foot depths. Experienced fishermen warn that boaters should stay alert for submerged rocks in some parts of the lake. Just east of the lake, Barr Hill Nature Preserve has 256 acres of trails and mountain views. For eating, shopping and country-style nightlife — including a summertime performance series — Greensboro is nearby, and Craftsbury is about five miles away. Where to Stay: Greensboro: Highland Lodge, Lakeview Inn, the Big Brown House historic home available for rental; Craftsbury: Bricabode Bed and Breakfast, Mill Village Road B&B, Three Bee's Guest House. Where to Eat: Craftsbury: Craftsbury General Store. Where Else to Visit: Miller's Thumb Gallery, art exhibits in a historic grist mill, Greensboro; Woods Edge Farm, Greensboro; Hill Farmstead Brewery, Greensboro Bend; Jasper Hill Farm and Cellars, Greensboro; Greensboro Blues Jam concerts, every second summer Saturday at the Caspian Lake Grange, Greensboro; Circus Smirkus, the youth circus troupe based in Greensboro, performs in town on occasion; Willey's Store, Greensboro; Craftsbury General Store; Craftsbury Outdoor Center. What's Interesting: A blockhouse was built at Caspian Lake as part of the never-finished Bayley Hazen Road project ordered by general George Washington to ease the way for military action in Canada. Just a couple of miles from the Canadian border, Lake Carmi is the fourth-largest natural lake in Vermont. Surrounded by rolling farmland, it has a long-entrenched summer community of cottages and Adirondack-style camps dotting its 7.5-mile shoreline. Lake Carmi reaches just 33 feet at its maximum depth, making it one of the state's warmest lakes for swimming. Lake Carmi State Park spans two miles on the southern and eastern shore, providing two beaches, picnic areas and a boat launch. The Franklin Bog, a 140-acre peat bog at Lake Carmi's southern end, has been designated a state natural area. These wetlands contain an uncommonly large mass of black spruce and tamarack trees, as well as thick undergrowth of pitcher plants and sphagnum moss. Lake Carmi visitors might see migrating ducks and geese, mating loons, bald eagles, and great blue herons. The wildlife doesn't stop the motor boaters, and sailboats and windsurfers dot the lake in the summer. Fishermen can catch northern pike, walleye, perch, smallmouth bass and panfish. The village of Enosburg Falls, about a 15-minute drive, is a bend in the road but offers most of the area's options for dining and lodging. Where to Stay: Enosburg Falls: Lake Carmi State Park campground, Enosburg Inn & Suites, Berkson Farm Bed & Breakfast, Somerset Inn, Dairy Center motel. Where to Eat: Franklin: the Old Bowling Alley Restaurant, for burgers and creemees; Enosburg Falls: the 1906 House, the Abbey restaurant and pub, Dairy Center Restaurant, Halvy's Café; East Berkshire: Pine Cone Snack Bar. Where Else to Visit: Franklin General Store, Franklin; Missisquoi Valley Rail Trail, South Franklin; Cold Hollow Sculpture Park, Enosburg Falls; the Enosburg Opera House; Dairy Center Bowling Lanes and arcade, Enosburg Falls. What's Interesting: Lake Carmi once had a bowling alley (now the Old Bowling Alley Restaurant) and roller-skating rink on its northern tip, and held Thursday night dances that attracted rug cutters from as far as St. Albans. Vermont has three Silver Lakes, but the one in Barnard is considered among the prettiest watering holes, surrounded by rolling hills and farmland. It's about 10 miles from the busy tourist town of Woodstock, with a long list of dining and shopping options. Swimmers will find a sandy area in Silver Lake State Park on the northwestern shore, as well as picnic grounds and camping. The lake is small enough, at 90 acres, that it doesn't attract many motorboats. Frequent catch include northern pike, perch and smallmouth bass. The park encompasses former sheep and dairy farms, and the campground area still houses the remnants of a barn foundation. Barnard General Store is a fixture in the community, overlooking the lake's western tip and featuring an old-fashioned lunch counter. Where to Stay: Barnard: the Fan House bed and breakfast, Twin Farms resort; Woodstock: Maple Leaf Inn and many other lodgings. Where to Eat: Barnard: the Barnard Inn Restaurant and Max's Tavern; Woodstock: Cloudland Farm restaurant, the Prince & the Pauper, Melaza Bistro and other options. Where Else to Visit: Barnard General Store; Barnard Historical Society, inside the Village School House; Fable Farm, Barnard; shopping and galleries in Woodstock; Sugarbush Cheese & Maple Farm, Woodstock; Billings Farm & Museum, Woodstock; Porter Music Box Company, Randolph. What's Interesting: Barnard General Store shut down in 2012 after 180 years in business owing to ailing finances. About a year later, the community saved the store by raising $500,000 to buy the property and leasing it to new operators. There's not much more to Elmore than the lake, which a sign at the park entrance calls a "Beauty Spot." It sits at the northern tip of CC Putnam State Forest, in the rolling farmland of Lamoille County. The charming Elmore Store, a small grocery that includes the local post office, sells ice cream and yogurt from Kingdom Creamery in East Hardwick and recently offered pizza with local fiddleheads as a topping. The town also has a public boat launch. Most activity at the lake centers on Elmore State Park, a popular camping spot with a sandy beach, picnic pavilion and historic beach house built by the Civilian Conservation Corps. Water-skiers and Jet Skis share the 219-acre lake with kayaks, canoes and sailboats. Fishermen catch warm-water yellow perch, northern pike, smallmouth bass, bullhead and panfish. About six miles up the road, the village of Morrisville is the closest thing to a metropolis. Where to Stay: Elmore: Elmore State Park campground and beach house; Stowe Meadows mountain lodge; Morrisville: Sunset Motor Inn, Muddy Moose cabins, Maple House Inn, Thistledown Inn Bed & Breakfast, Village Victorian Bed & Breakfast. Where to Eat: Elmore: the Elmore Store; Morrisville: the Bee's Knees, Mountain View Snack Bar, Deb's Place, Thompson's Sandwich Shop, Sammy's, the Stonegrill Restaurant & Pub, Green Dragon, Moog's Place. Where Else to Visit: Elmore Sugarhouse; Noyes House Museum, an 1820s-era building with a collection of 19th-century Vermont artifacts, Morrisville; Rock Art Brewery and Lost Nation Brewing, both in Morrisville; North Wolcott Country Store, Wolcott; Johnson Woolen Mills, Johnson. What's Interesting: One source says visitors in the early days could take tours of Lake Elmore on a "steam-powered yacht." The original print version of this article was headlined "Jump In"